This panel discussion is to share views and experiences on women's participation in public life in two countries, namely, UAE and Japan. The panelists include: Eng. Fatima Obaid Al-Jaber, Assistant Under-secretary, Municipalities and Agriculture Department, Professor Mariam Lootah, Department of Political Science, UAE University, Ms. Tamiko Iguchi, Secretary General, The Center for the Advancement of Working Women (CAWW), and Ms. Setsuko Ishizaki, Japanese Association of International Women's Rights. Not only female but also male participants are welcomed to the event. For further information, please contact Ms. Nishimoto at 02-4435696 at Embassy of Japan. "Disaster Reduction Japan's Global Contribution"
Five Japanese Karate masters from different Karate schools in Japan demonstrated their advanced techniques; enthralled the audience in a fascinating show. Karate is a very unique sport of Japan, literally meaning "empty hands". It is the art of self-defense that uses no weapons and relies on techniques. 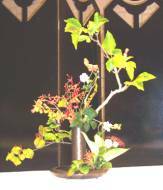 Flower arrangement art in Japan is known as "IKEBANA". In contrast to the purely decorative Form of flower arranging popular in Western countries, the art of "IKEBANA", seeks to create a harmony of liner construction, rhythm, and color. 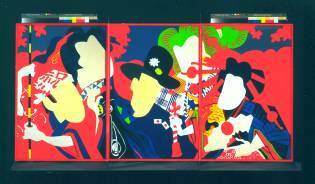 This stunning exhibition has been organized to introduce the contemporary prints of Japan. It includes 74 works by 46 artists, all from the Japan Foundation collection. The works range from the 1950s to the present in order to give a broad overview. Wide varieties of artists and types of work have also been selected to give the spectator a good idea of the range of this art form in postwar Japan. "Drum" is one of the most ancient instruments used throughout the world. As one finds drum in the relics of many ancient cultures, Taiko (Japan drum) is also found amongst the Japanese relics from the ancient periods. The sound of Taiko travels far, and for that reason, it was originally used as a tool of communication. Introduction to the "Wadaiko Matsumura Gumi"
(Traditional Japanese Drums Matsumura Group)[The Wadaiko Matsumura Gumi] was founded in Kobe in 1995. They have created a world of original sound that has not existed until now by combining the reassuring strength of the traditional Japanese drums with folk musical instruments such as the marimba and kaena. 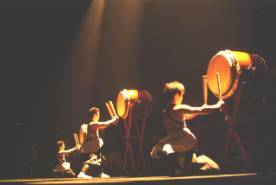 Their performance styles, from solo performances of the "o-daiko" (great drum), which are said to be the quintessence of waidaiko, to musical works suggesting quite classical symphonic pieces, that develop an intensity of a very large ensemble, and imparts an excitement and fascination amongst their many fans. The group is involved in multifarious activities, such as working on the opening theme music for a television program, performing in a television commercial for Kobe Newspaper, and performing for the opening of the 2002 World Soccer Cup Tournament in Kobe. At present, three CDs, Lotus Flower, Big Group, and Star Festival, and the single Kobe Departure have been released. Since October 2003, their fifth nationwide concert tour, Continent of the Wind, is in the middle of being expanded. The group was the winner of the 2001 Kobe City Cultural Encouragement Prize, and the Heisei Year 15 (2003) Hy™go Prefecture Arts Encouragement Award. If you are interested in learning Japanese language you may have a chance to start and brush up your language by joining beginner and higher-level courses, which will be organized by the UAE-Japan Society in cooperation with the Embassy of Japan during September to November 2004. All courses are open to the public without restrictions to age or nationality. A beginners' course will start from Sunday, September 19 at the Abu Dhabi Oil Company (ADOC). Those wishing to attend a higher course are advised to contact the Embassy of Japan. Application forms and other details are available at the Information and Cultural Section of the Embassy of Japan. The deadline for submitting application forms to the Embassy of Japan is September 15, 2004. Course length Two hours a week, from September 19 to November 28, 2004. Place The Abu Dhabi Oil Company ADOC (1st floor), Khalidiah, opposite to old Lamcy Plaza. For other courses (Upper beginners, Intermediate, etc.,) students are advised to contact the Information and Cultural Section of the Embassy of Japan before September 15. For enrollment, one recent photo is required. For further information, please contact the Information and Cultural Section, Embassy of Japan.